When inflammation harms instead of helps—and how to stop it. When you catch an infection, your body responds with redness, swelling, and pain. This is called inflammation. It’s how our immune system gets rid of intruders. This response is an essential part of the healing process. But inflammation can also work against us—when things go wrong, it can become a major driver of disease. How can something that heals also make us sick? It depends on how long inflammation lasts. Stress triggers inflammation. If that stress is an infection, the immune system turns on the inflammatory response until the invader is thwarted, and the body goes back to normal. But when stress is constant and the immune system can’t kill it, inflammation never shuts off, and a process that should be temporary becomes permanent. 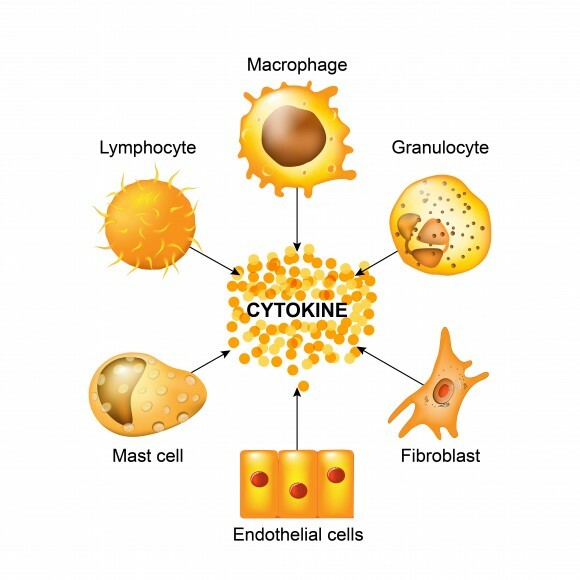 Inflammation is regulated by substances called cytokines, which are proteins made by the immune cells to communicate with each other. These inflammatory chemicals are produced in response to a cold or flu, and we feel achy and fatigued for a few days until the immune system prevails. However, when cytokines are triggered in response to anxiety or depression, they don’t bring help, only hurt. That’s why people with chronic inflammation always feel achy and fatigued. But chronic inflammation is more than just an inconvenience. In recent decades, researchers have discovered that this steady drip of cytokines underlies a host of illnesses such as Alzheimer’s disease, rheumatoid arthritis, asthma, certain cancers, diabetes, heart disease, obesity, and osteoporosis, as well as psychiatric disorders like anxiety, bipolar disorder, depression, schizophrenia, and post-traumatic stress disorder. This new understanding of inflammation is one of the most important discoveries in health research in recent years, according to Dr. George M. Slavich, director at the Laboratory for Stress Assessment and Research at the University of California–Los Angeles (UCLA). “All told, inflammation is involved in at least eight of the top 10 leading causes of death in the United States today. Understanding how inflammation promotes poor health, and how and when we can intervene to reduce inflammation-related disease risk, should thus be a top scientific and public priority,” Slavich wrote in a March 2015 article in the journal Brain Behavior Immunity. Several researchers point to the unrelenting stress of modern life as the key culprit in the rise of chronic inflammation. One is Dr. William Malarkey, professor emeritus of internal medicine and director of clinical research at the Center for Clinical and Translational Science (CCTS) at Ohio State University Wexner Medical Center. During periods of prolonged stress, people seem to age before our eyes: presidents as they serve out their term, couples struggling through a divorce, or those enduring the death of a loved one. We are resilient creatures, so our bodies can recover after a rough period. But when stress doesn’t let up, and our ability to recover is diminished, inflammation eventually leads to disease. “Your heart attack didn’t just happen today, it started 20 or 30 years ago with this process,” Dr. Malarkey said. Stress is a fact of life, but why do some people handle hard times better than others? In studying the stress response, Dr. Malarkey has identified five domains that act as buffers to adversity. He calls the model REMAP. R is for relational engagement: connectedness with family members and friends. E is for emotional sensibility: a healthy emotional life. M is for meaningful engagement: satisfaction and meaning in different aspects of life. A is for awareness of self and others: perceptions and reflections that influence how we feel about ourselves and how we relate to others. P is for physical health behaviors: getting good nutrition, regular exercise, and good-quality sleep, and abstaining from smoking and other harmful substances. The stronger we are in preserving these domains, the better our resilience to stress, says Dr. Malarkey. If we fail in these domains, our immune system gets activated. The good news is that change is possible. The good news is that change is possible. Research has shown that when patients work to improve in these five domains, they can prevent the effects of chronic stress. Growing awareness of this inflammatory model of disease has given rise to anti-inflammatory supplements to treat it, such as turmeric and fish oil capsules. These interventions have been shown to reduce inflammation, but their impact is tiny compared to the influence of the mind. Lots of mental factors contribute to our stress adaptability, but having a sense of purpose plays a key role. Lots of mental factors contribute to our stress adaptability, but having a sense of purpose plays a key role, Dr. Malarkey says. This often includes activities that make us feel we are a part of something bigger: spiritual practices, positive contribution, or helping others in need. The strength of our relationships is another key factor in how well we handle stress. Loneliness can be particularly damaging and a key factor in bad health or disease, says Dr. Malarkey. The groundwork for stress resilience (or lack thereof) starts early in life. In a study published in 1999, researchers found that newborn rat pups who were taken from their mothers in the first week of their lives developed different brain chemistry than rats who got to have mom close by. Within just one week without contact, the rats’ levels of the stress hormone cortisol went into overdrive and couldn’t shut off. Similar brain chemistry has been found in humans who experienced a dysfunctional childhood and committed suicide later in life–their receptors for glucocorticoid, the hormone that cuts off cortisol production, were silenced. According to Dr. Malarkey’s research, those who adapt to stress best are people with an active social life and solid relationships. These people are emotionally optimistic and are always engaged in learning new things. They sleep well, because their worry level is very low, and they participate in some sort of regular exercise. What you eat and how much you move can also have a significant influence on your inflammatory environment. “Food is a powerful regulator of the gut microbiome, which is a huge inflammatory regulator of the immune system. Nutrition can affect changes in cells,” Dr. Malarkey said. Sugar, fried foods, and vegetable oils high in omega-6 fatty acids are notorious contributors to inflammation, while fresh fruits, vegetables, and foods high in omega-3 fatty acids help turn off the inflammatory response. Exercise, too, plays a major role in regulating inflammation, but it can also be one of the hardest habits to adopt. Two of the biggest complaints among people with chronic inflammation are pain and fatigue. No one wants to move when they’re feeling sore and tired, but making even a little effort toward regular exercise can have a big impact in the long run. Because it puts stress on the body, exercise initially triggers inflammation. But this brief spike falls away once your workout is finished. Over time, this regular burst of activity helps decrease chronic inflammation, as exercise helps the body become better adapted to stress. Experts advise combining light aerobic and weight training or resistance exercises to best reduce inflammation. If that doesn’t get you moving, then consider that an out-of-shape body becomes more efficient at generating inflammation. An abdominal bulge isn’t just unsightly—it actually develops into an extra gland, complicating an already dysfunctional endocrine system. As far back as the 1950s, researchers noticed behavioral and endocrine responses to stress. Although the idea of inflammation as the root cause of chronic disease has been gaining steam in the medical community in recent years, the concept is at odds with the prevailing notion that genetic fate decides who gets sick and who doesn’t. But Dr. Malarkey says genes alone don’t tell the whole story. “People get stuck in this thinking: ‘My Daddy got this, so therefore I’m going to get it.’ Well, it’s not the genes. It’s the fact that you’re all anxious and you all eat the same way. It’s your environment. These things alter the way genes get expressed. That’s why you’re all getting heart disease,” he said. Exercise, eat right, make friends, get enough sleep, try not to worry, and fulfill your purpose in life: The lessons of REMAP sound suspiciously similar to the no-nonsense health advice doctors have been giving for ages. But to Dr. Malarkey, this is proof that he’s on the right track. “In my opinion, all the traditional systems of medicine all involve the same processes that I am now putting into contemporary psychology and basic science and biology,” he said.